Klaus Scherübel, La Répétition (Prototype), VOL. 24, 2016. The Leonard & Bina Ellen Art Gallery, SBC Gallery of Contemporary Art and VOX, centre de l’image contemporaine host a major event entitled Putting Rehearsals to the Test, accompanied by a film program presented at the Cinémathèque québécoise and at VOX. The three curators of the exhibition, Sabeth Buchmann, Ilse Lafer, and Constanze Ruhm, bring together over fifty international artists who address a set of positions and strategies in contemporary art that consider rehearsal as both subject and practice. While the subject of ‘rehearsal’ is popular in film and theatre, as well as in the fine arts, it has been scarcely considered in historical and contemporary art discourses. It is with this in mind that the exhibition Putting Rehearsals to the Test investigates the role and function of the notion of “rehearsal,” understood as a methodology, a modus operandi, a medium, a site of representation and reflection for artistic production processes. 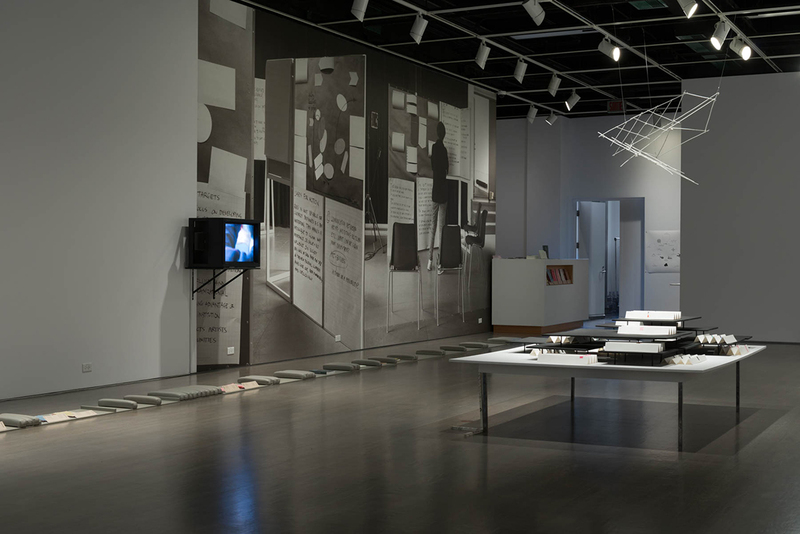 Building off of the notion of script with respect to scripting(s), this exhibition’s narrative points toward conceptual tools and documents such as scores, notations and actual scripts that themselves document earlier choreographies or events, or contingent elements that serve as instructions for prospective actions and situations; for example, Yoko Ono’s Grapefruit Book (1964/1970), whose scores evoke transitory topologies. Understood as rules that are generated through practice, these scripts render (when actualized) temporal and hierarchical distinctions between (historical) text and (actual) work. Such is the role of the performers in Martin Beck’s film The Environmental Witch-Hunt (2008), who in dealing with the ambivalent character of screenplay and instruction do what they rehearse and rehearse what they do. Deviating from the genre of re-enactment, the nexus of script and rehearsal doesn’t serve to reconstruct a historical event; rather, it intervenes in linear orders of the past, present and future in order to compound heterogeneous forms of (re-)articulation. With the video Test Print #2 (1989/2016), former theatre group minimal club (1983-1999) document their project Naturidentische Stoffe (nature-identical matter) by walking the camera through the exhibition space. Through this circumnavigation, rehearsals are constructed as momentary acts of interference between actors and objects. Based on a set of rules to be used as instructions for daily rehearsals and/or upcoming actions, scripts are located at the intersection and upon the fault lines between the performative and visual arts. 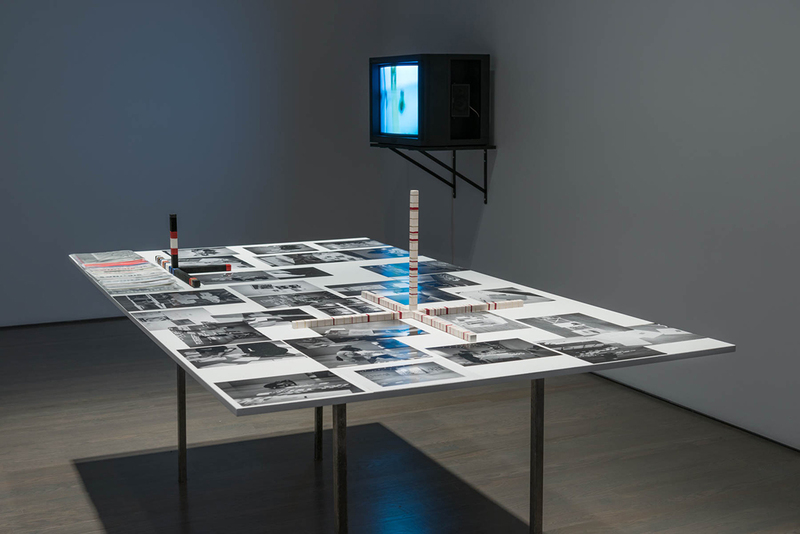 At the same time, they deal with the (immaterial) ideas and (material) embodiments found between the routines and contingencies of “producing” and “making” art, as in the case of On Kawara’s Today Series (1966-2013), where the structure of daily life coincides with the timing of artistic labour. Since the artist understands his work to be daily “exercises,” executed in order to overcome egocentric notions of authorship, the linked procedures of repetition, permeation and alteration can be interpreted as a rehearsal in the sense of the ongoing work in becoming. Here a relation can be drawn with Hanako Geierhos’s Ontological Research (2011-2016), where the distinctions between minimalist forms, theatrical props and functional displays are blurred in order to create continuous and ever-shifting communication between objects and subjects—a moment that Geierhos’s Transitory Rituals (2012/2016) acts out by staging and projecting gestures (see SBC and VOX). Displaying a comparable structure of interrelations, Falke Pisano’s work examines the role of mathematical speculation as a prescription for social and aesthetic practice. By isolating the traces of ideology in language, be it articulated through speech or extra-communicative gestures, rehearsals as a practice become sites and tools for a dialectics of trial and error, of functionality and failure. This bears on the construction of socio-cultural identity of subjects and objects, offering a means to address the history of colonialism and xenophobia, as in works by Katarina Zdjelar and Wendelien van Oldenborgh. 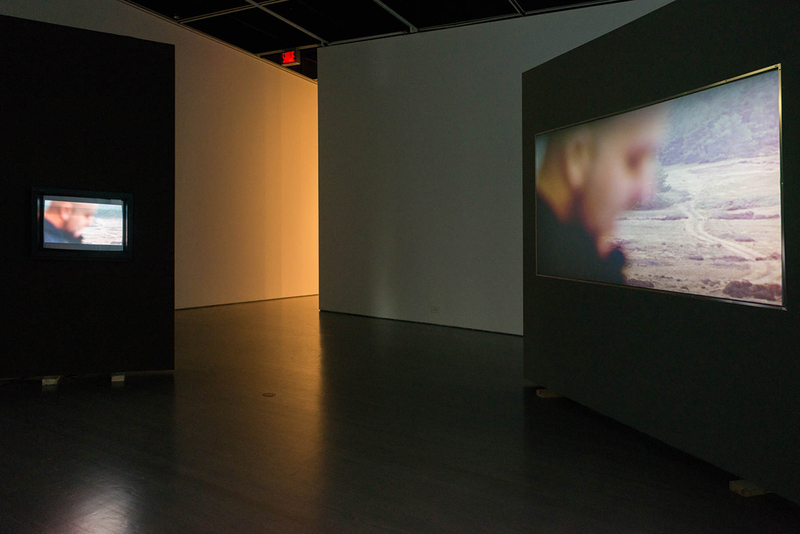 In this frame, “speech acts” (as examined by Beck and Pisano) appear as “cultural techniques” that constantly must be rehearsed for the sake of mutual understanding and intercultural translation, but also in order to neutralize cultural and social differences (as seen in Zdjelar’s work The Perfect Sound (2009)). Rehearsals not only reveal the ideology and normativity behind verbal and body language, but also locate it in visual and aesthetic conventions. 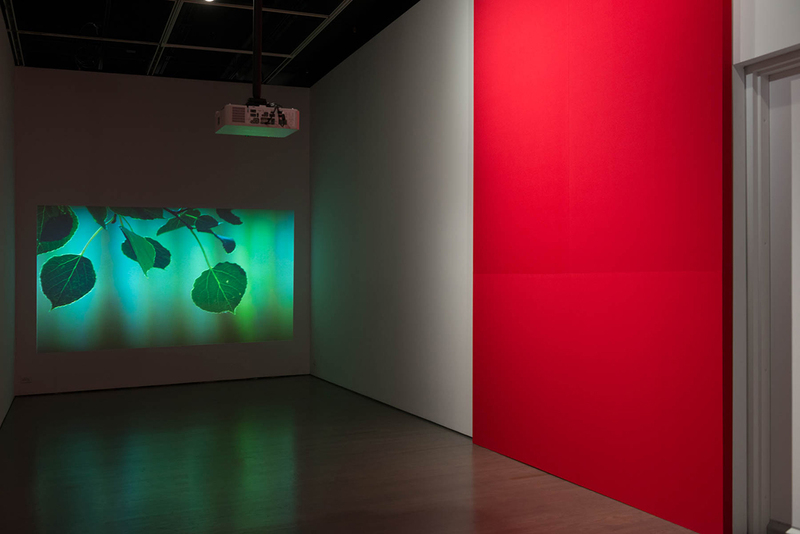 In her video installation No False Echoes (2008), Wendelien van Oldenborgh reflects on a program run by Philips Omroep Holland Indië, a broadcasting station operated by the Philips Corporation. Referring to its function as a medium for Dutch propaganda during the colonial occupation of Indonesia, the artist collaborated with invited speakers who offered a means to readdress the original project through recitations of their own experiences or the performance of texts drawn from colonial and anti-colonial documents. When conceived as exercises, painterly gestures and actions can point beyond the suggestion of authenticity and individual expression to the timing and localization of art production. With painting, Merlin Carpenter relates rehearsing gestures to the institutional rules of exhibiting. 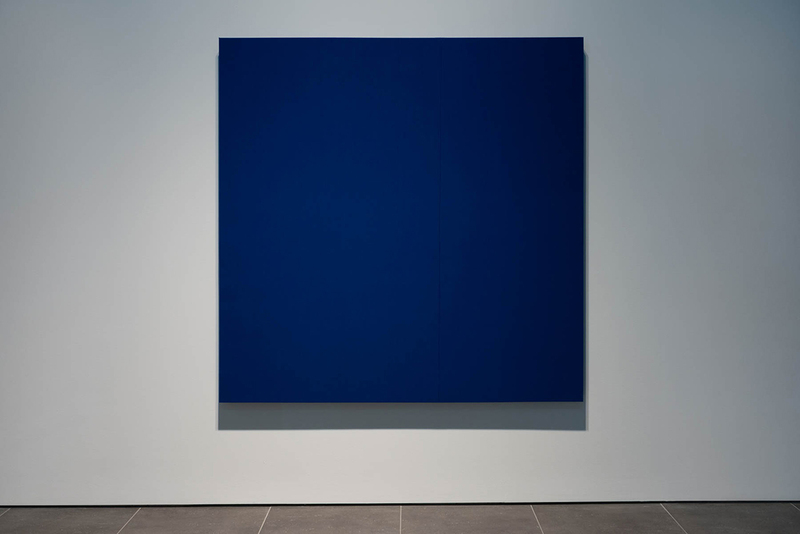 His “opening paintings” operate as both time- and site-specific, oscillating between incomplete and ongoing productions or resolved and non-repeatable works (see VOX). Reproducing documentation of the conceptual bulletin boards used in A Model of Possible Action: An Experiment to Develop a New Methodology of Institutional Cooperation (2013), as a mural, Krüger & Pardeller emphasize the role these surfaces play as placeholders for information and mediation, marking the necessity of trying out new ideas toward collective (inter-)action (see SBC). The reciprocal effects of learning and un-learning correspond with the modes of cinematic production, where political (self-)analysis is found in the framing of “in-the-making” procedures in order to create the source code for the overlapping spheres of art and politics. Repetitive exercises point to the internalized conditions of labour regimes and (self-) exploitation. Harun Farocki’s and Constanze Ruhm’s films reflect on the transformation of human beings into an accumulation of (gender-)roles that further trigger (stereo-)types and figures. Similarly, Rainer Bellenbaum’s video installation GOETHE/STRASSEN (2016) links geographical marked spaces and urban sites through accidental and staged performances by residents and passersby: scenes that foreground rehearsal as a historical and cultural technique inscribed into literary and cinematographic models of dialogue. The performance of roles and figures in their work requisitions the (invisible) scripts that dictate behavioural, psycho-emotional and social patterns, a strategy shared with Ono, Beck and Pisano’s respective work. Regina (Maria) Möller’s curtains operate as a medium of transition between public and institutional spaces, embodying the transition between figure and actor, between “real” and “fictitious” space. Literally marking the symbolic position of rehearsal by integrating a large flag displaying a white chalk mark on a black background, an “X” signifying, on the one hand, the actors’ position, and on the other, a sign for shifting identities. Accordingly, the curtains blur the distinction between exhibition and theatre space: on stage is behind stage, after the rehearsal is before the rehearsal. Figures, roles, space, and time appear as entities that are never identical and are instead based on multiple differences and shifting relations. Achim Lengerer’s continuous practice of editing magazines titled Scriptings serves as a tool for collaborative reading and writing as well as a medium that can be figured as a transitory object. Dealing with subjects and methodological devices from various fields (art, literature, film, theory, politics, science and technology) the editorial process creates a rehearsal-like scenario in which the participants (the active ones as well as the visitors) adopt and perform shifting roles. Here, Scriptings#46, A catalogue, in any case unreasoned and incomplete replaces the conventional exhibition texts. 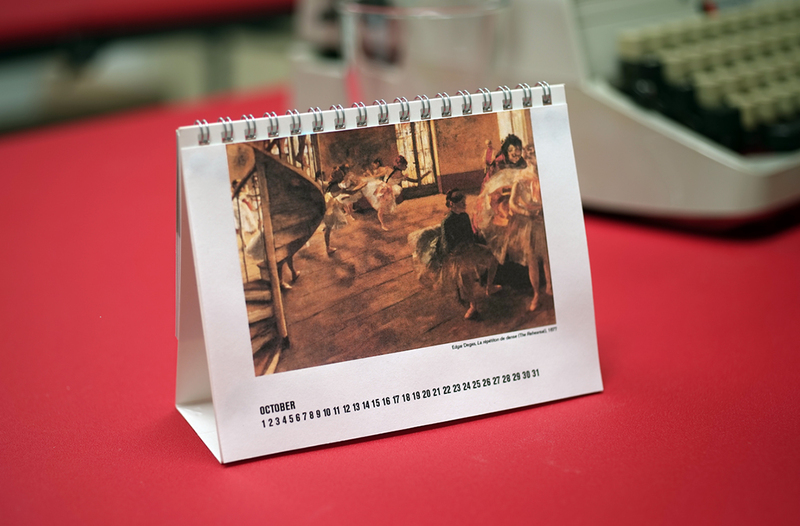 Using a reproduction of one of Edgar Degas’s famous dance rehearsal paintings, aptly titled The Rehearsal (1874), Klaus Scherübel conceives a “calendar object” La répétition (Prototype), VOL. 24 (2016) whose presentation corresponds to the individual timeframes of the three exhibitions at the Leonard & Bina Ellen Art Gallery, SBC Gallery of Contemporary Art and VOX, centre de l’image contemporaine. While every page of the calendar always displays the exactly same reproduction of the painting, it always refers to a different month, in this case from August to December. Conceptually autonomous in its referentiality to the history of painting, it becomes a functional object as well. When the Guests Are Not Looking (2016) by Richard Ibghy & Marilou Lemmens is a series of ephemeral, invisible performance rehearsals centered on the character of Denis Diderot’s dialogue Rameau’s Nephew (1762-1777). These performances take place outside of the galleries’ opening hours and are accessible only by way of a publication. While Ibghy & Lemmens’s ghost performer, whose actual existence is uncertain, literally rehearses in the institutional off space, Marie Claire Forté and Alanna Kraaijeveld (in dialogue with Sophie Bélair Clément) render visible a set of coordinates where the performers’ labour can be witnessed as their bodies moving through the history of choreography in their unannounced rehearsals titled Rehearsals for Collections de danses de Christian Rizzo, Gene Kelly et Stanley Donen, Édouard Lock, William Forsythe, Merce Cunningham, Saburo Teshigawara, Trisha Brown; Jeffrey Daniel, Michael Jackson et Vincent Patterson, Mats Ek, Dana Michel; Dana Foglia, Chris Grant et JaQuel Knight, Crystal Pite, Pina Bausch, Lloyd Newson, Tedd Robinson, Hofesh Shechter, Bob Fosse, Anne Teresa de Keersmaeker, Daniel Linehan, Amanda Acorn, Jiři Kilyán, Akram Khan, Stijn Celis, Deborah Hay, Liz Santoro et Pierre Godard, Marie Claire Forté, Meg Stuart et Philipp Gehmacher et d’autres. Together with Achim Lengerer’s Scriptings publication, these performances take place in and around all three spaces, thereby linking the three scenarios of the exhibition Putting Rehearsals to the Test into one complex constellation of rehearsals. Considering the exhibition as an entanglement of content, method and form, where each component is indissolubly linked, the idea of rehearsal here is not reducible to an assumed method underlying the exhibition. Rather, it is in the work that an exhibition as rehearsal is able to release—a work that isn’t always visible—where rehearsal can be found oscillating between the notion of “the making of” (rehearsal as narrative subject) and as something “in-the-making”(rehearsal as work to be offered). The complete essay can be downloaded in the Texts and Documents section. This event is made possible through the invaluable support of the BKA – The Arts and Culture Division of the Federal Chancellery of Austria, the Austrian Cultural Forum/Austrian Embassy, the Goethe-Institut, IFA – Institute for Foreign Cultural Relations (Germany), the Mondriaan Fonds (Netherlands), the Canada Council for the Arts, the Conseil des arts de Montréal and the Conseil des arts et des lettres du Québec.